Archives for "Staff Profiles" category. Most of you know our team down at Club Olympus in Garden City. However, if you don't, we like you to be up-to-date. Here below is Gabby Rhodes who heads up our Kids Klub and Animation at the resort. Gabby is the daughter of Ivan at Club Olympus and has been with us for 6 years. Here below is Jose Reyes of our Reception Team. He is holding up our recent award from Booking.com for achieving 8.3 excellence rating. Jose has been with us for 11 years. 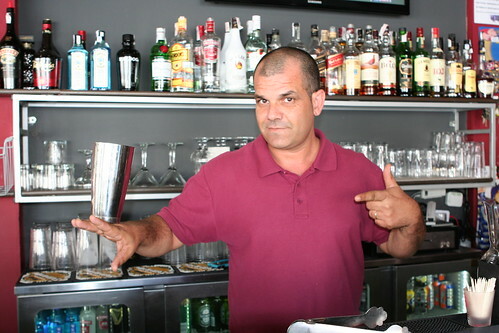 Our next shot is of Hugo Martel, partner of Louise who runs the Poolside Bar. Hugo is a qualified Cocktail waiter as well as being one of the star members of our Poolside Bar team! Hugo has been with Club Olympus for 3 years. After a very succesful summer we decided to take the boys and girl of the In-House team for lunch. The waiter took this very wobbly picture for us. From left to right, Ray, Ivan, Dawn and Tony. 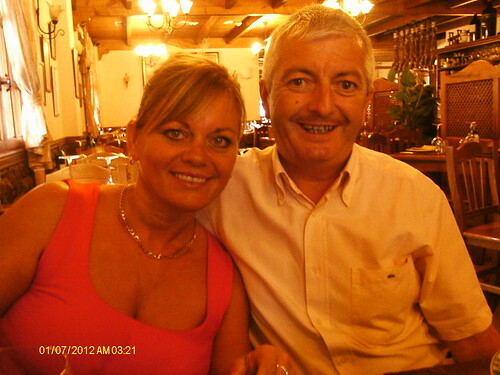 We went to a great little restaurant in La Camella, the name of which just escapes me! Ray as you can see, had his customary light snack! You will no doubt be meeting these guys when you come out to the resort. The Maintenance Team did an outstanding job with the work on the Pool. They also worked very hard in blistering sun so, to say thank you for their work above and beyond the call of duty, Club Olympus took them for a spot of lunch. From left to right going round the table we have Jean Faichney (Club Secretary and Operations Manager), Evelio (Head of Maintenance), Javi, Salvador, Nicolas, Ismail, Miguel-Angel and Peter Rhodes. Missing from the picture is Juan Carlos. 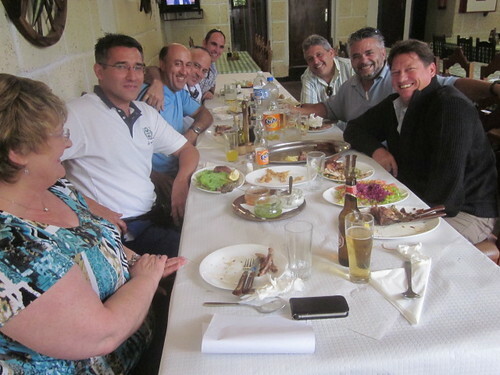 We enjoyed a great lunch at one of our favourite spots, Era Las Mozas. It's been a while since we saw Ray devour a big steak so here we go! 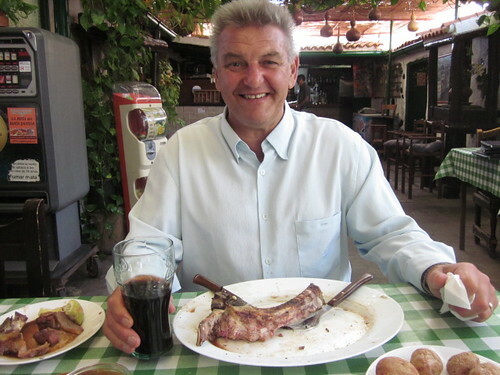 Ray Karlsen, our In-House Team Manager, really does enjoy his meat. 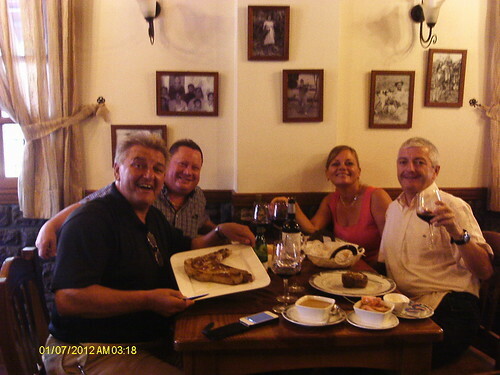 One of our favourite restaurants is "Era Las Mozas" in the town of 'Valle San Lorenzo'. 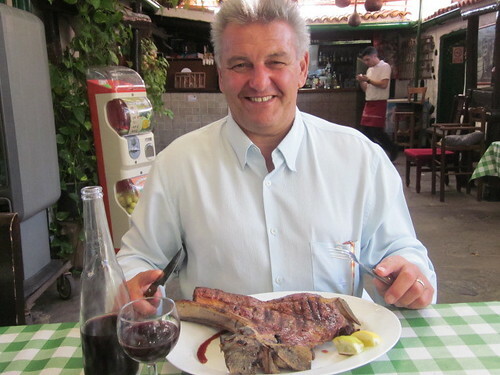 They specialise in all types of barbecued meat but their signature dish is the 'Chuleton' which is the T-bone from an Ox. And to be honest, they don't last long when Ray is around! As you know, Club Olympus is very much a family concern. 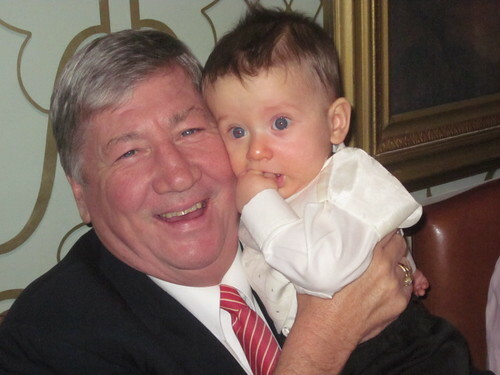 Here below is another shot of Olympus Group Chairman and Club Olympus Developer Hedley Rhodes with his Great Grandson, Solomon. The photograph was taken during Hedley and Jane's Golden Wedding Anniversary celebrations in the UK just recently.